Chilis Grill & Bar – Whether you want to unwind with friends or just dont feel like cooking, head to Chilis Grill & Bar for our sizzlin service, laid-back atmosphere and a taste of our spiced-up Southwestern favorites like our famous Grilled Baby Back Ribs, our juicy Big Mouth Burgers or our tender marinated fajitas. 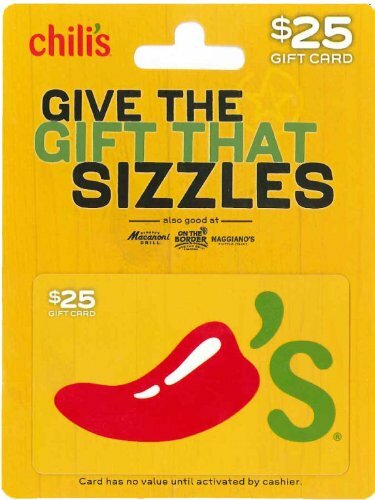 Give the gift that SIZZLES. Brinker is dedicated to Serving the World a Great Taste of Life®. Head to Chili’s Grill & Bar for our sizzlin’ service & spiced-up favorites, Romano’s Macaroni Grill where we celebrate the traditions of Italy, On The Border for a vibrant antidote to the expected Mexican experience or Maggiano’s Little Italy where our guests get “more of everything”. 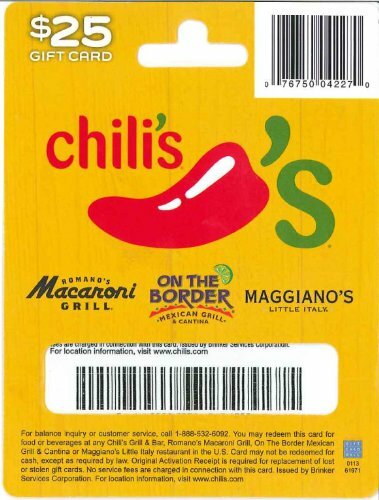 Redeem at retail location nationwide including Chili’s Grill & Bar, Romano’s Macaroni Grill, On The Border and Maggiano’s Little Italy.